Antarctic is the fifth largest continent of the world at 14 million square kilometres and is covered by a permanent continental ice sheet. 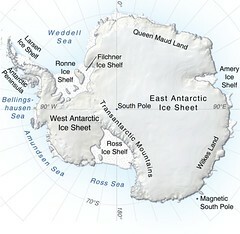 The ice is distributed in two major ice sheets, the East Antarctic and the West Antarctic, and in addition there are shelf ice, extending over the sea water. Antarctic inland ice ranges in thickness up to 5000 m, with an average thickness of about 2400 m, making Antarctica by far the highest of the continents. Straddling the South Pole, Antarctica is cold even during summer. Much of the continent is a cold desert with very low precipitation rates. 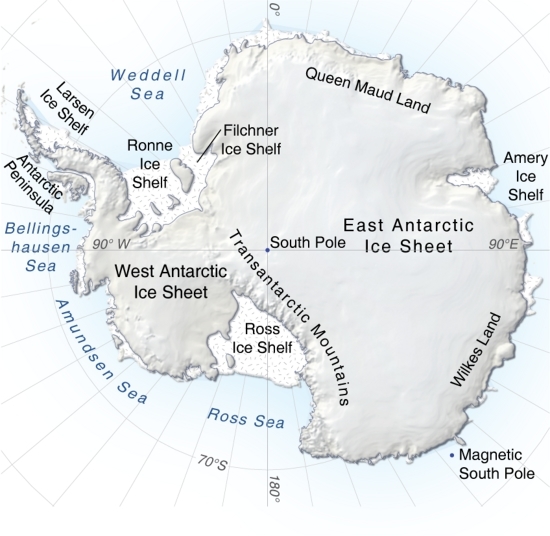 Thus, in contrast to Greenland, only a tiny proportion of the mass loss from the Antarctic Ice Sheet occurs by melting from the surface – summertime melt from the margins of the ice sheet only occurs in the northern Antarctic Peninsula and the northernmost fringes of East Antarctica. Instead, most ice loss from Antarctica is from basal melting and iceberg calving from the vast floating ice shelves. The West Antarctica Ice Sheet drains mostly into the Ross Ice Shelf, at the head of the Ross Sea; but also into the Filchner/Ronne Ice Shelf (two connected ice shelves), at the head of the Weddell Sea; and into small ice shelves along the Amundsen Sea coast. The Ross and Filchner/Ronne ice shelves are each about the area of Spain.